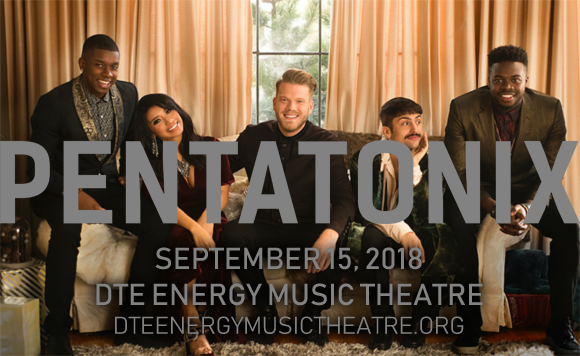 Grammy Award-winning a capella five-piece Pentatonix comes to DTE Energy Music Theatre on Saturday 15th September 2018 for a night of pop hits and hot harmonies! The group are touring to promote their upcoming album PTX Presents: Top Pop Vol. 1, so fans can expect exciting new arrangements from this talented crew! Don't miss your chance to see some of the most talented voices in pop! Formed in 2011, Pentatonix are an American a capella singing group who came to prominence when they won the third season of NBC's The Sing-Off that same year, winning $200,000 and a recording contract with Sony Music. Known for their inventive vocal arrangements of popular songs, after being released from Sony Music, the group started their own YouTube channel to showcase their songs, which is currently the 50th most-subscribed-to YouTube channel with over 13 million subscribers and 2.7 billion views. To date, Pentatonix have won three Grammy Awards; Best Arrangement, Instrumental or A Cappella in 2015 and 2016 (the first ever a capella act to win from this category) and Best Country Duo/Group Performance in 2017. To date, they have released five EPs, two full length Christmas albums and one studio album, with their second due for release this year.